This queen sleeper sofa will bring a lodge look to your cozy family room or living room. A three cushion style and wide rolled arms create casual and cozy characteristics. Perfect for extra seating in your home or cabin, this sofa sleeper provides comfortable seating by day and extra sleeping space by night with its custom comfort premium innerspring mattress. Adding charming designs are large, tapered, wood feet and throw pillows that are reversible. Novelty patterns combined with a leather-look-alike provide the perfect choice for your cabin or retreat home. Enhance the look of this sleeper sofa and arrange it with a matching loveseat, chair, sofa, and ottoman. The Jaden Queen Sleeper with Large Rolled Arms by England at Jordan's Home Furnishings in the New Minas, Halifax, and Canning, Nova Scotia area. Product availability may vary. Contact us for the most current availability on this product. Fabric Options Available in multiple fabric options. Arm Wide rolled arms add to the over-sized, cozy appeal. Leg or Skirt Tapered, plastic block feet add to casual charm. The Jaden collection features inviting and cozy designs, while obtaining a unique and charming style. Wide rolled arms and plush cushions creates an over-size appeal, and makes it easy to sink in and relax. Exposed, tapered feet and reversible throw pillows continue to add to the simple charm. 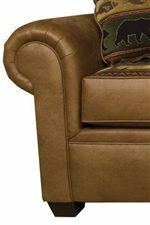 Novelty patterns combined with a leather-look-alike provide the perfect choice for your cabin or retreat home. Featuring a sofa, loveseat, chair, ottoman, and queen sleeper, the Jaden collection will bring warmth into your home. The Jaden collection is a great option if you are looking for Casual furniture in the New Minas, Halifax, and Canning, Nova Scotia area. Browse other items in the Jaden collection from Jordan's Home Furnishings in the New Minas, Halifax, and Canning, Nova Scotia area.